Before: Thirty years ago I thought, This is too good to be true the first time I laid eyes on the view from my living room window. The overcast day could not disguise the miles and miles of sky that unfurled. That, combined with the space of 5 rooms sold me. My spouse at the time hadn’t joined me for the search. He was in a perpetual snit then; we’d reached the 5-year mark of living together in a 2½ room apartment on Riverside Drive and the strain was beginning to show. Though our rent would double (to $434 and change per month)he’d be hard pressed to reject the opportunity; More space, I convinced myself, would fix our issues. For a time I was right. I’ll never forget the day after we moved in and stepped out on the fire escape to wash the windows. When we looked south we gasped—I’m not kidding. There they were: Rockefeller Center, the Citicorp Building, the Chrysler Building and the old twin towers of the World Trade Center stabbing the sky, beckoning like an Emerald City to us, 2 Ohioans who, despite having already lived in Manhattan for 5 years, still tended to be over-impressed with such things. For a while we were healed, but even bandaids fall off. When things turned between us, the view served up solace on sleepless nights; I’d go out and sit with my cup of tea and try to pinpoint the moment we went off, or any number of fruitless gambits to put us all right. Eventually he moved out leaving me the apartment and the view. My fifth floor aerie took on a new significance. I weathered more sleeplessness, but also re-built myself. All the talking-tos, all the problem solving happened as I stared at a New York recast through the filter of someone suddenly flying solo. 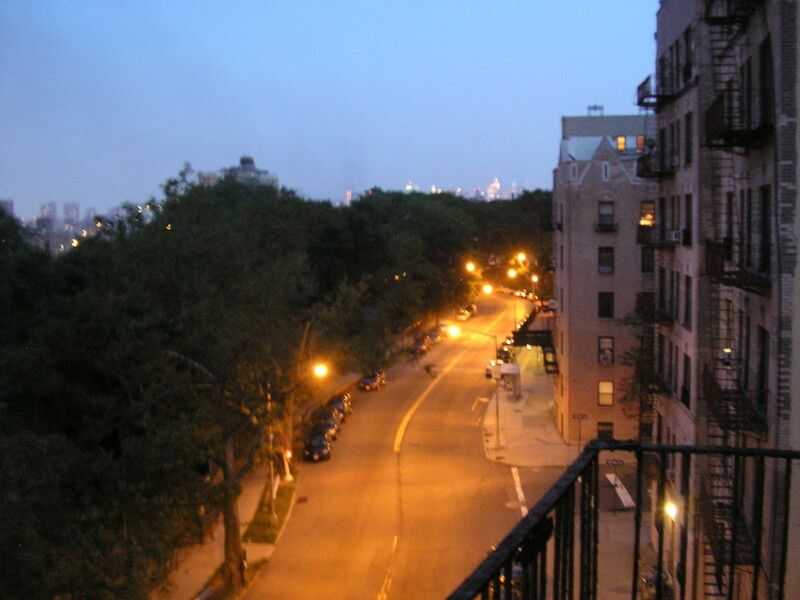 The fire escape became my second office, a place to read, write letters, tend to plants, and with the aid of a long phone cord, bathe in the voices of friends who held me up through those tricky years. By the time someone new came to set up shop in my heart—and the closet next to mine—I’d taken that Southern view for granted. 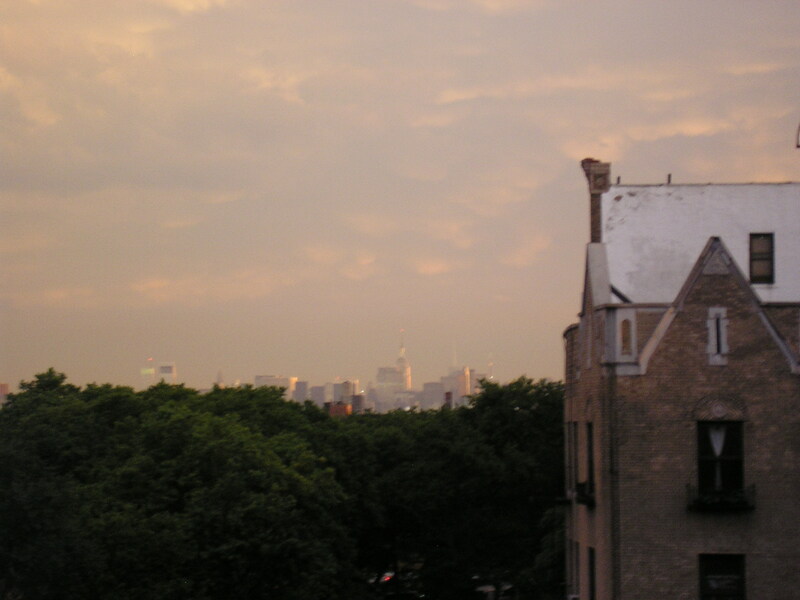 After he moved in new routines manifested while we gazed South: summer drinks; the planting of marigolds and roses in big terra cotta pots; gawking at fireworks exploding over Central Park and the East River, and the passing parade of the landed gentrifiers. After: Stability can blur realities. When it was announced that a combined residence/arts center would go up on the corner of 155th Street and St. Nicholas Avenue I didn’t pay much attention to the artist rendering, though there was a moment when I felt bad for the folks who used the parking garage that occupied the site (people from North of the city parked, then jumped on the conveniently located C train just across the street). 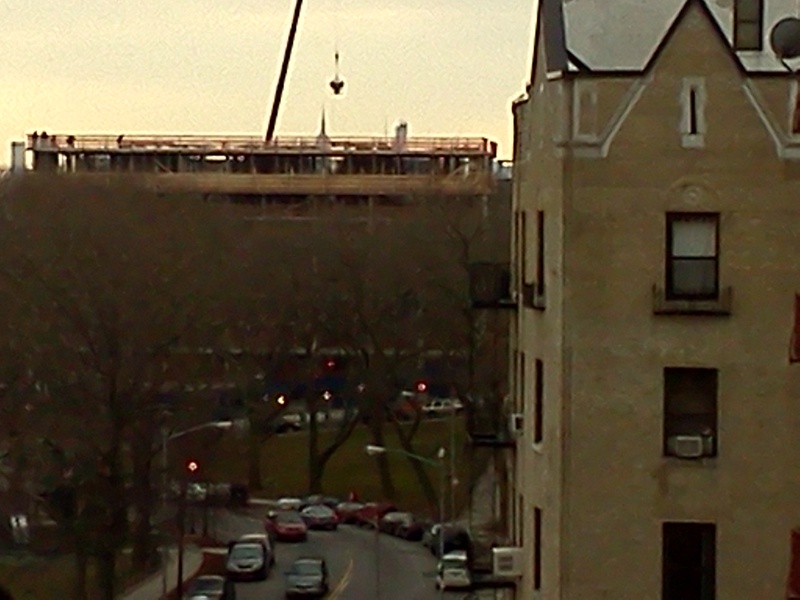 The construction noise was blessedly faint, making it easy to ignore the rising floors and the building’s sprawl. And then one afternoon I stepped out on the fire escape. I could only see the tip of the Empire Building—the bones of what can only be described as a dull horizontal slab blacked all else out. In a day or so the “view” had disappeared. 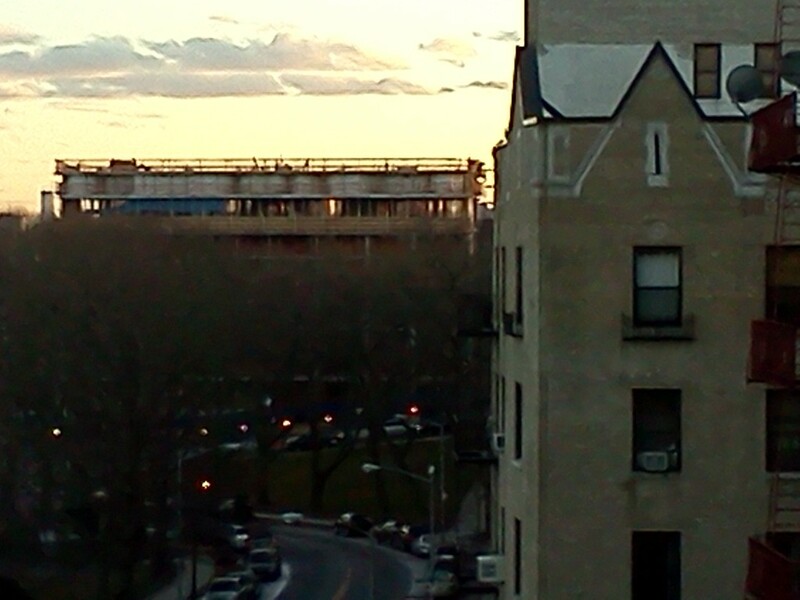 Gone were the landmarks; gone, the treetops of Central Park and a big swatch of sky. Later I found out this section was actually only the building’s bottom half. By the end of 2013 something more than twice that height would constitute my Southern exposure. Ouch. Sondheim said that pretty is what changes; too bad my inner child can’t always embrace such beauty, or accept that ties to the past break with every passing moment.